For other people named David Garrick, see David Garrick (disambiguation). David Garrick (19 February 1717 – 20 January 1779) was an English actor, playwright, theatre manager and producer who influenced nearly all aspects of theatrical practice throughout the 18th century, and was a pupil and friend of Dr Samuel Johnson. He appeared in a number of amateur theatricals, and with his appearance in the title role of Shakespeare's Richard III, audiences and managers began to take notice. Impressed by his portrayals of Richard III and a number of other roles, Charles Fleetwood engaged Garrick for a season at the Theatre Royal, Drury Lane. He remained with the Drury Lane company for the next five years and purchased a share of the theatre with James Lacy. This purchase inaugurated 29 years of Garrick's management of the Drury Lane, during which time it rose to prominence as one of the leading theatres in Europe. At his death, three years after his retirement from Drury Lane and the stage, he was given a lavish public funeral at Westminster Abbey where he was laid to rest in Poets' Corner. As an actor, Garrick promoted realistic acting that departed from the bombastic style that was entrenched when he first came to prominence. His acting delighted many audiences and his direction of many of the top actors of the English stage influenced their styles as well. During his tenure as manager of Drury Lane, Garrick also sought to reform audience behaviour. While this led to some discontent among the theatre-going public, many of his reforms eventually did take hold. Garrick also sought reform in production matters, bringing an overarching consistency to productions that included set design, costumes and even special effects. Garrick's influence extended into the literary side of theatre as well. Critics are almost unanimous in saying he was not a good playwright, but his work in bringing Shakespeare to contemporary audiences is notable. In addition, he adapted many older plays in the repertoire that might have been forgotten. These included many plays of the Restoration era. Indeed, while influencing the theatre towards a better standard he also gained a better reputation for theatre people. This accomplishment led Samuel Johnson to remark that "his profession made him rich and he made his profession respectable." Garrick was born at the Angel Inn, Widemarsh Street, Hereford in 1717 into a family with French Huguenot roots in the Languedoc region of Southern France. His grandfather, David Garric, was in Bordeaux in 1685 when the Edict of Nantes was abolished, revoking the rights of Protestants in France. Garric fled to London and his son, Peter, who was an infant at the time, was later smuggled out by a nurse when he was deemed old enough to make the journey. David Garric became a British subject upon his arrival in Britain, and Anglicised the name to Garrick. Some time after David Garrick's birth the family moved to Lichfield, home to Garrick's mother. His father, a captain in the army, was a recruiting officer stationed in Gibraltar through most of young Garrick's childhood. Garrick was the third of seven children and his younger brother, George (1723–1779), would be an aide to David for the remainder of his life. The playwright and actor Charles Dibdin recorded that George, discovering his brother's absence would often inquire "Did David want me?" Upon Garrick's death in 1779, it was noted that George died 48 hours later, leading some to speculate that "David wanted him". His nephew, Nathan Garrick, married Martha Leigh, daughter of Sir Egerton Leigh, and sister of Sir Samuel Egerton Leigh, author of Munster Abbey; a Romance: Interspersed with Reflections on Virtue and Morality (Edinburgh 1797). O coward conscience, how dost thou afflict me! – Shakespeare's Richard III Act V, Sc. 3. 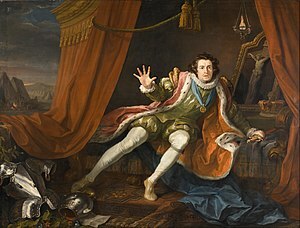 David Garrick in 1745 as Richard III just before the battle of Bosworth Field, his sleep having been haunted by the ghosts of those he has murdered, wakes to the realisation that he is alone in the world and death is imminent. Painting by the English painter William Hogarth. At the age of 19, Garrick, who had been educated at Lichfield Grammar School, enrolled in Samuel Johnson's Edial Hall School. Garrick showed an enthusiasm for the theatre very early on and he appeared in a school production around this time in the role of Sergeant Kite in George Farquhar's The Recruiting Officer. After Johnson's school was closed, he and Garrick, now friends, travelled to London together to seek their fortunes. Upon his arrival in 1737, Garrick and his brother became partners in a wine business with operations in both London and Lichfield with David taking the London operation. The business did not flourish, possibly due to Garrick's distraction by amateur theatricals. Playwright Samuel Foote remarked that he had known Garrick to have only three quarts of vinegar in his cellar and still calling himself a wine merchant. In 1740, four years after Garrick's arrival in London and with his wine business failing, he saw his first play, a satire, Lethe: or Aesop in the Shade, produced at the Theatre Royal, Drury Lane. Within a year he was appearing professionally playing small parts at the Goodman's Fields Theatre under the management of Henry Giffard. The Goodman's Fields Theatre had been shuttered by the Licensing Act of 1737 which closed all theatres that did not hold the letters patent and required all plays to be approved by the Lord Chamberlain before performance. Garrick's performances at the theatre were a result of Giffard's help with Garrick's wine business. Giffard had helped Garrick win the business of the Bedford Coffee-house, an establishment patronised by many theatrical and literary people and a location Garrick frequented. He made his debut as a professional actor on a summer tour to Ipswich with Giffard's troupe in 1741, where he played Aboan in Oroonoko, a play by the British dramatist Aphra Behn. He appeared under the stage name Lyddal to avoid the consternation of his family. But, while he was successful under Giffard, the managers of Drury Lane and Covent Garden rejected him. On 19 October 1741, Garrick appeared in the title role of Richard III. He had been coached in the role by the actor and playwright Charles Macklin and his natural performance, which rejected the declamatory acting style so prevalent in the period, soon was the talk of London. Of his performance at Goodman's Fields, Horace Walpole remarked, "there was a dozen dukes a night at Goodman's Fields". Following his rousing performance, Garrick wrote to his brother requesting withdrawal from the partnership to devote his time completely to the stage. Having found success with Richard III, Garrick moved onto a number of other roles including Tate's adaptation of Shakespeare's King Lear and Pierre in Otway's Venice Preserv'd as well as comic roles such as Bayes in Buckingham's The Rehearsal; a total of 18 roles in all in just the first six months of his acting career. His success led Alexander Pope, who saw him perform three times during this period, to surmise, "that young man never had his equal as an actor, and he will never have a rival". With his success at Goodman's Fields, Charles Fleetwood, manager of Drury Lane, engaged Garrick to play Chaumont in Otway's The Orphan (a role he first played in Ipswich) on 11 May 1742 while he used his letters patent to close down Giffard's theatre. That same month, Garrick played King Lear opposite Margaret "Peg" Woffington as Cordelia and his popular Richard III. With these successes, Fleetwood engaged Garrick for the full 1742–43 season. At the end of the London season, Garrick, along with Peg Woffington, travelled to Dublin for the summer season at the Theatre Royal, Smock Lane. While in Dublin, Garrick added two new roles to his repertoire: Shakespeare's Hamlet, Abel Drugger in Ben Jonson's The Alchemist (a role that earned him much acclaim) and Captain Plume in Farquhar's The Recruiting Officer. Some of his success could be attributed to one of his earliest fans, John Boyle, 5th Earl of Cork, who wrote letters to many noblemen and gentlemen recommending Garrick's acting. His writings led Garrick to exclaim that it must have been the reason he was "more caressed" in Dublin. With the end of the 1746–1747 season, Fleetwoods' patent on Drury Lane expired in partnership with James Lacy, Garrick took over the theatre in April 1747. The theatre had been in a decline for some years, but the partnership of Garrick and Lacy led to success and accolades. The first performance under Garrick and Lacy's management opened with an Ode to Drury Lane Theatre, on dedicating a Building and erecting a Statue, to Shakespeare read by Garrick and written by his friend, Dr. Johnson. The ode promised the patrons that "The drama's law the drama's patrons give,/For we that live to please must please to live." Certainly this statement could be regarded as succinctly summing up Garrick's management at Drury Lane where he was able to balance both artistic integrity and the fickle tastes of the public. Garrick and his wife, Eva Marie Veigel, painted by William Hogarth. From the Royal Collection, Windsor Castle. After the Woffington affair there were a number of botched love affairs, including possibly fathering a son with Jane Green. Garrick met Eva Marie Veigel (1724–1822), a German dancer in opera choruses who emigrated to London in 1746. The pair wed on 22 June 1749 and were preserved together in several portraits, including one by William Hogarth. Hogarth also made several drawings and paintings of them separately. The union was childless but happy, Garrick calling her "the best of women and wives", and they were famously inseparable throughout their nearly 30 years of marriage. Garrick's increasing wealth enabled him to purchase a palatial estate for Eva Marie and himself to live in, naming it Garrick's Villa, that he bought at Hampton in 1754. He also indulged his passion for Shakespeare by building a Temple to Shakespeare on the riverside at Hampton to house his collection of memorabilia. In September 1769 Garrick staged the Shakespeare Jubilee in Stratford-upon-Avon. It was a major focal point in the emerging movement that helped cement Shakespeare as England's national poet. It involved a number of events held in the town to celebrate (five years too late) 200 years since Shakespeare's birth. In a speech made on the second day of the Jubilee in Stratford Garrick recognized the Shakespeare Ladies Club as those who "restor'd Shakespeare to the Stage," protecting his fame and erecting "a Monument to his and your own honour in Westminster Abbey." No Shakespeare plays were performed during the Jubilee, and heavy rain forced a Shakespeare Pageant to be called off. The Pageant was first staged a month later at Drury Lane Theatre under the title The Jubilee and proved successful enjoying 90 performances. The song "Soft Flowing Avon" was composed by Thomas Arne, with lyrics by Garrick, for the Jubilee. Garrick would manage the Theatre Royal, Drury Lane, until his retirement from management in 1776. In his last years he continued to add roles to his repertoire; Posthumus in Cymbeline was among his last famous roles. Shortly before his death he worked on the production of The Camp with Sheridan at Drury Lane and caught a very bad cold. The Camp was based around the British response to a threatened invasion by France, leading some to jokingly claim that Garrick was the only casualty of the ultimately abandoned invasion. He died less than three years after his retirement, at his house in Adelphi Buildings, London, and was interred in Poets' Corner in Westminster Abbey. Mrs. Garrick survived her husband by 43 years. His great-grand-niece was the famous soprano Malvina Garrigues and her first cousin, the Danish-American doctor Henry Jacques Garrigues. Perhaps it was Garrick's acting, the most showy of his careers, that brought him the most adulation. Garrick was not a large man, only standing 5'4", and his voice is not described as particularly loud. From his first performance, Garrick departed from the bombastic style that had been popular, choosing instead a more relaxed, naturalistic style that his biographer Alan Kendall states "would probably seem quite normal to us today, but it was new and strange for his day." Certainly this new style brought acclaim: Alexander Pope stated, "he was afraid the young man would be spoiled, for he would have no competitor." Garrick quotes George Lyttelton as complimenting him by saying, "He told me he never knew what acting was till I appeared." Even James Quin, an actor in the old style remarked, "If this young fellow be right, then we have been all wrong." his over-fondness for extravagant Attitudes, frequently affected Starts, convulsive Twitchings, Jerkings of the Body, Sprawling of the Fingers, slapping the Breast and Pockets:-A Set of mechanical Motions in constant Use-the Caricatures of gesture suggested by pert vivacity,-his pantomimical Manner of acting every Word in a Sentence, his Unnatural Pauses in the middle of a sentence; his forc'd Conceits; -his wilful Neglect of Harmony, even where the round Period of a well express'd Noble Sentiment demands a graceful Cadence in the delivery. "David Garrick in Vanbrugh's Provoked Wife, Theatre Royal, Drury Lane" by Johann Zoffany, 1763. The Garrick Club in London, named in his honour. Garrick's Temple to Shakespeare, built on Garrick's Lawn in the riverside gardens of his Villa near Hampton Court, now restored as a memorial to David Garrick and his life in Hampton, London. I am disappointed by that stroke of death that has eclipsed the gaiety of nations, and impoverished the public stock of harmless pleasure. Garrick was the first actor to be granted the honour of being buried in Westminster Abbey, in Poets' Corner next to the monument to William Shakespeare. Later Henry Irving, the first actor to be knighted, was buried beside him on the same spot. Laurence Olivier was the third to be given that honour, in 1989. Cedric Hardwicke portrayed Garrick in the 1935 British film Peg of Old Drury. A film made in 1937, a comedy called The Great Garrick directed by James Whale is a fictional story revolving around Garrick's acting skills and his ego which inspires the Académie française to teach him a lesson. The film stars Brian Aherne as Garrick. In 1969, Ian McShane played Garrick in an episode of the British television series Rogues' Gallery. He appears as a character in the plays David Garrick (1864) and Mr Foote's Other Leg (2015). A School House at King Edward VI School, Lichfield, is named after him. The lyrics he penned for "Heart of Oak" remain, with William Boyce's music, the official March of the Royal Navy. Legend has it that he was so engrossed in a performance of Richard III that he was oblivious to a bone fracture, inspiring the theatrical felicitation "Break a leg!". There was a pub in Milton Keynes named after him in the Theatre District, open from 2000 and closed in 2016. The Garrick Inn, reputedly Stratford-upon-Avon's oldest pub, is named after him. The Garrick Bar, a Belfast pub named after him since 1870. Two amateur dramatic theatres in Greater Manchester, the Altrincham Garrick Theatre and the Stockport Garrick, also take his name. A Community Theatre located north of Perth, Western Australia, is named after Garrick. A Community Theatre located in Bonavista, Newfoundland, Canada, is named after Garrick. 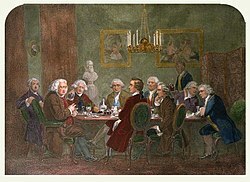 'A literary party at Sir Joshua Reynolds's'. Use a cursor to see who is who. ^ Kendall 1985, p. 12. ^ a b Carruthers & Ward 1911, pp. 475–77. ^ Kendall 1985, p. 13. ^ Bellot 1956, p. 187. ^ a b c d Hartnoll 1983, p. 315. ^ Kendall 1985, p. 17. ^ Kendall 1985, p. 19. ^ Holland 1995, p. 411. ^ a b c d Carruthers & Ward 1911, pp. 475–477. ^ a b Woods 1996, p. 291. ^ Hartnoll 1983, p. 231. ^ Kendall 1985, p. 27. ^ Kendall 1985, p. 26. ^ Sheaf & Howe 1995, p. 55. ^ Richmond Library staff 2011. ^ Pierce 2005, pp. 4–10. ^ qtd. in Stochholm 1964, p. 91. ^ Pierce 2005, pp. 9–10. ^ Ennis & Slagle 2007, p. 217. ^ Greenway 1999, pp. 81-82. ^ BSO staff 1909, p. 554. ^ Sechelski 1996, p. 380. ^ Nichols & Bentley 1812, p. 554. Freedley, George and Reeves, John A. (1968). A History of the Theatre. New York, Crown. Stochholm, Johanne (1964), Garrick's Folly: The Shakespeare Jubilee of 1769 at Stratford and Drury Lane, New York: Barnes & Noble Inc.
Oya, Reiko (2007). Representing Shakespearean Tragedy: Garrick, the Kembles, and Kean. Cambridge University Press. Swanson, Alan (2013). David Garrick and the Development of English Comedy. The Edwin Mellen Press. This page was last edited on 24 February 2019, at 12:39 (UTC).